Clarendon 1021 Summer Rooftop Parties are the best thing in Arlington. Nothing beats having 100-200 friends at your rooftop. Just last night, we had a rooftop party where 4 different groups got along on the rooftop. 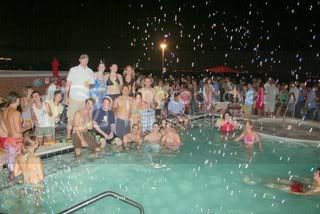 The music, hottub and pool are open til midnight. 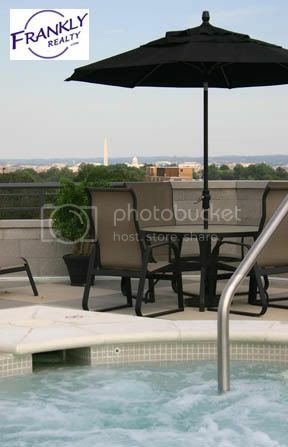 The best part of the rooftop is the Washington Monument view. Also when I think about the other condos that have pools on the ground level (besides the fact that they only get sun 50% of the day) , I just can't imagine them being able to pull in such a large crowd. The noise would go up into the condos and it just wouldn't work. The only place that might have a better rooftop would be the Odyssey Condos in Courthouse... but that is Courthouse. When everyone was done last night at midnight, they walked 1 block to the Clarendon bars. Unfortunately, the partiers on the pool were so obnoxiously loud and drunk, someone vomited on the carpet near the elevator on their way home. Disgusting. Looks like a grand celebration of Clarendon's mouthbreathing set. And I'm sure the vast majority of the building's residents appreciate it. Thanks for the run-down; I'll be sure to avoid this building like the plague. They say that negative people are 10 times more likely to post comments vs positive people. That is a shame. I didn't hear of the vomiting and I would have. Maybe it did happen. Heck anything can happen. I was actually very impressed by how everyone got along. Just yesterday somebody was saying how much they loved the social aspect of the building and how they are meeting new people. Even one nearby building owner that used to live in 1021 says he misses it. Just isn't the same. 1021: Mouthbreathers' Abode. It's just not the same anywhere else. Huh? What the heck is that? This is great, I have always used my statistics against the top producers. list vs. sold, expiration percentage, cancellation percentage but i really like this approach. Editorial Note: The original definition of mouth-breather referred to a person that, due to medical problems (usually with the sinuses or nose), was forced to breath via the mouth. This leaves the jaw hanging open at most times, which has a tendency to make a person look dopey or spacey. For those of you following this thread, I just added a video of the party. I love you you knock Courthouse like it's in Falls Church or something when it's really about three blocks from Clarendon.